KENNEDY SPACE CENTER, FL – Modernization of NASA’s launch infrastructure facilities at the Kennedy Space Center supporting the new SLS/Orion architecture required to send astronauts on a Journey to Mars in the 2030s, has passed a comprehensive series of key hardware reviews, NASA announced, paving the path towards full scale development and the inaugural liftoff by late 2018. The facilities and ground support systems that will process NASA’s mammoth Space Launch System (SLS) rocket and next generation Orion manned deep space capsule at NASA’s Kennedy Space Center in Florida successfully completed a painstaking review of the plans by top agency managers and an independent team of aerospace experts. The Ground Systems Development and Operations Program (GSDO) group within NASA is responsible for processing SLS and Orion. “Over the course of a few months, engineers and experts across the agency reviewed hundreds of documents as part of a comprehensive assessment” said NASA. Among the GSDO ground support facilities evaluated in the launch infrastructure review are the Vehicle Assembly Building (VAB) where the rocket components are stacked, the mobile launcher used to roll out SLS/Orion to Launch Pad 39B atop a modified crawler transporter and the Multi-Payload Processing Facility that will fuel the Orion spacecraft with propellants prior to stacking atop the rocket. In December, GSDO completed a critical design review (CDR) of the facilities and ground support systems plans. Then in January, a Standing Review Board comprising a team of aerospace experts completed an independent assessment of program readiness. “NASA is developing and modernizing the ground systems at Kennedy to safely integrate Orion with SLS, move the vehicle to the pad, and successfully launch it into space,” said Bill Hill, deputy associate administrator of NASA’s Exploration Systems Development Division at the agency’s Headquarters in Washington, in a statement. Fabrication, installation and testing of Kennedy’s ground systems can now proceed. Furthermore, earlier this month on March 10, NASA engineers conducted a successful test firing of the first of the RS-25 rocket engines destined to power the core stage of the SLS stage rocket. The 500 second long hot fire test of engine No. 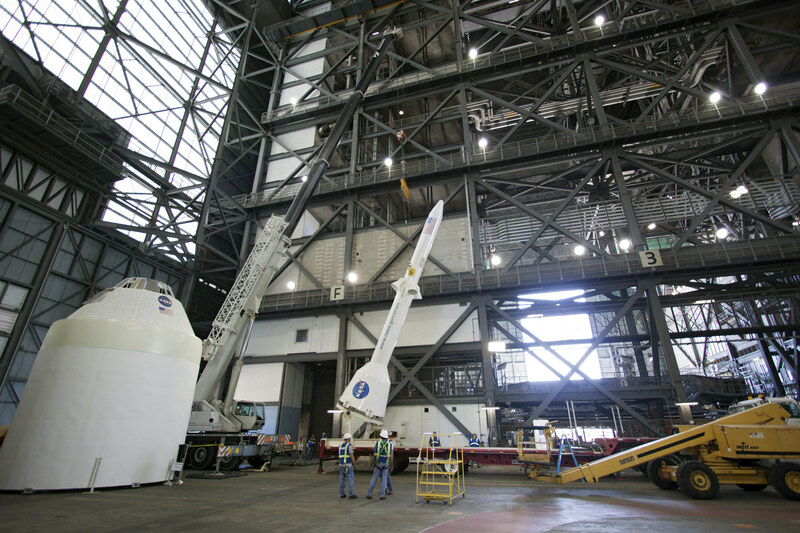 2059 was carried out on the A-1 Test Stand at NASA’s Stennis Space Center in Bay St. Louis, Mississippi. 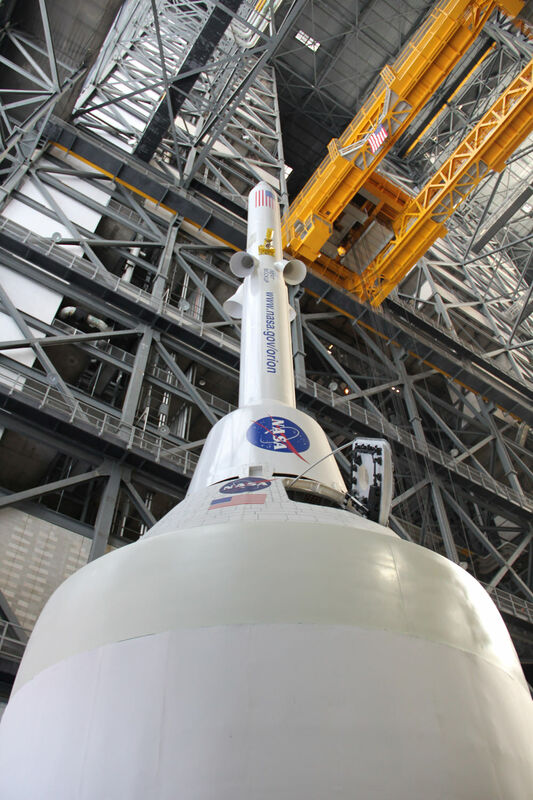 SLS-1 will boost the unmanned Orion EM-1 capsule from KSC launch pad 39B on an approximately three week long test flight beyond the Moon and back. To see one shorn shuttle is bad enough. Seeing two NASA space shuttles edged together and voluntarily gutted of their spaceflight capability for lack of Federal Government funding in the prime of their lives is beyond sad. Two of NASA’s trio of space shuttle orbiters – Discovery & Endeavour – switched locations at the Kennedy Space Center (KSC) on August 11, moving them further down the path to eternal retirement and public exhibit at their future homes in museums. That’s far afield from their intended purpose to soar as spaceships of exploration to the High Frontier. 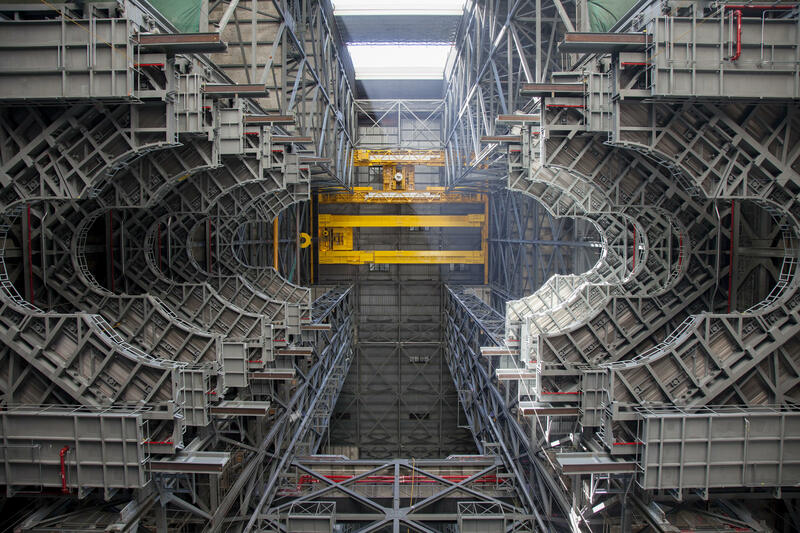 Discovery and Endeavour briefly met in a matchless nose-to-nose configuration for a roadside photo opportunity between the humongous Vehicle Assembly Building (VAB) and the processing hanger – dubbed the Orbiter Processing Facility – where the orbiters are prepared for flight. 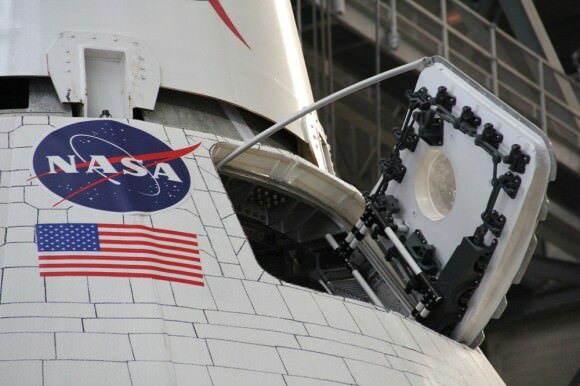 Space Shuttle’s Discovery and Endeavour swapped places at KSC so that technicians could resume preparations towards the transition and retirement of shuttle Discovery – the first of NASA’s orbiters to be officially withdrawn from active duty spaceflight service. 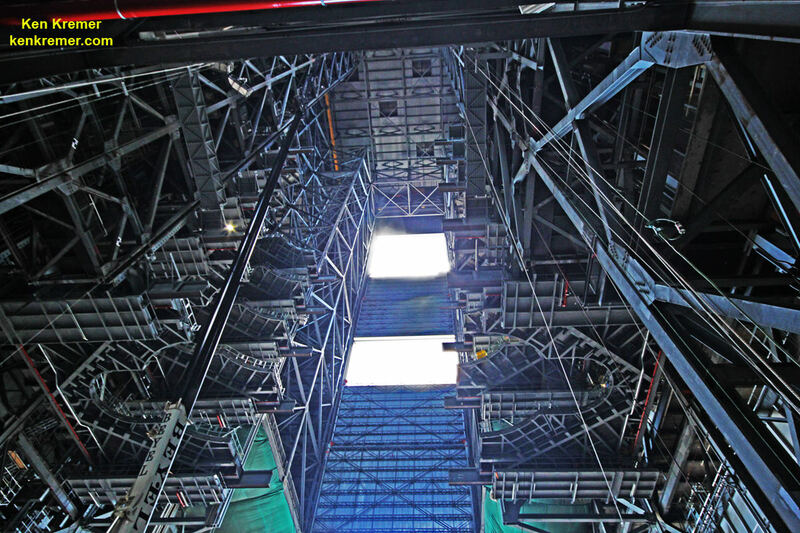 First, Discovery was backed out of temporary storage from a high bay inside the VAB. Then Endeavour was towed out of Orbiter Processing Facility-1. Technicians then maneuvered the orbiters to a rendezvous point in between on the ground. Just imagine how grand this vista would have appeared in space. At last Discovery and Endeavour met for the truly sad nosy encounter of gaping holes where the forward reaction control thrusters once fired to meticulously maneuver the shuttles in orbit. Protective plastic sheeting meant to shield the empty thruster bay from FOD – or Foreign Object Debris – was in tatters and whipping wildly in the wind almost from the moment Discovery emerged from the VAB. The rear ends of both orbiters looked like the main engines had been sawed off. Both orbiters have been stripped of their trio of mighty space shuttle main engines (SSME’s) and duo of bulbous Orbital Maneuvering System (OMS’s) pods for months of decommissioning work. Discovery was then pulled into the Orbiter Processing Facility-1 (OPF-1) where the next step is to extract even more of her guts, namely the Auxiliary Power Units (APU’s) and associated systems for “safing” over the coming months. 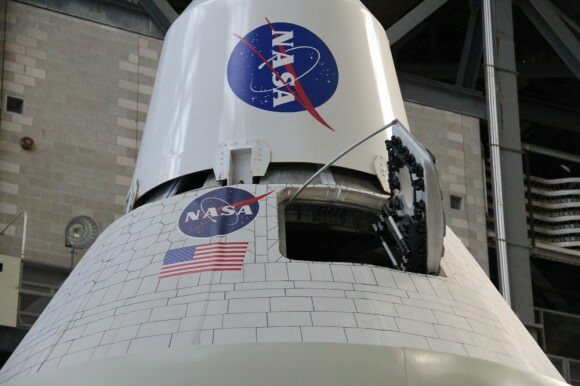 In April 2012, Discovery is scheduled to depart KSC forever and be flown off for permanent public display at the Smithsonian’s National Air and Space Museum Steven F. Udvar-Hazy Center in Virginia. Endeavour was towed into the VAB for storage until October, when she will be moved into OPF-2 for further work to ready her for public display at the California Science Center in Los Angles sometime next summer. Atlantis is next on the chopping block. And America retains zero indigenous capability for human spaceflight. The situation likely won’t change for at least several years until one of the commercial providers launches a human rated “space taxi” to low earth orbit.